SEC teams are 16-4 ATS in their last 20 bowl games as underdogs of six or more points. Florida fits that role against a Michigan team playing without three star playmakers in the Peach Bowl and sharp bettors were quick to take the points with the Gators. All eyes will be on college football on Saturday with the two semifinal games taking place later in the night but Saturday's early slate has garnered the attention of sharp bettors in Las Vegas. The wiseguys are backing Florida (+7 vs. Michigan) and South Carolina (-4.5 vs. Virginia) in two of Saturday's three early kickoffs, Westgate LV SuperBook oddsmaker Jeff Sherman told BetChicago. __$5,000 up for grabs:__ [Free-to-enter five-day pick 'em contest](https://betchicago.chalkline.com/games/five-days-of-football-for-5k) Florida has the trends to back up the sharp play against Michigan in the Peach Bowl. SEC teams are 16-4 ATS in their last 20 bowl games as underdogs of six or more points. The Wolverines are also 1-4 ATS on the road this season, 2-8 ATS in their last 10 away from The Big House, are 2-6 ATS as a favorite and are 1-4-1 ATS in their last six bowl games as a favorite. While Jim Harbaugh beat the Gators last season in the opener, 33-17, he won't have three playmakers between the trenches on Saturday. Michigan’s leading rusher the past two seasons Karan Higdon, defensive lineman Rashan Gary and All-American linebacker Devin Bush will all sit out of the Peach Bowl to [prepare](https://www.cbssports.com/nfl/draft/news/peach-bowl-2019-nfl-draft-prospects-to-watch-in-michigan-vs-florida-bowl-game/) for the NFL Draft. Before those announcements, the Wolverines had the S&P+ advantage in all three areas of the game, most notably on defense against Florida's methodical and non-explosive offense. But without its stars Michigan is a different team and you have to wonder about the team's desire to play in this game after having its College Football Playoff dreams crushed by rival Ohio State last time out. In Saturday's other Power 5 Noon matchup, South Carolina standout WR Deebo Samuel will [sit out](https://www.postandcourier.com/sports/south-carolina-missing-deebo-samuel-but-gamecocks-know-they-can/article_a6f3582a-093f-11e9-bcf0-473e06b1b964.html) of the Belk Bowl to prepare for the NFL Draft. Scouts are likely disappointed in the announcement since Samuel would have no better Draft prep than facing Virginia CB Bryce Hall, who is a NFL prospect of his own and helps the Cavaliers rank No. 1 overall in defensive back havoc rate and pass deflection to incomplete pass ratio. <a href="https://twitter.com/hootie_dotcom/status/1067187393080541185" class="embedly-card" data-card-width="100%" data-card-controls="0">Embedded content: https://twitter.com/hootie_dotcom/status/1067187393080541185</a> The Cavaliers stumbled into the Belk Bowl after losing back-to-back overtime games but their strong secondary should cause fits for the Gamecocks' 18th-ranked S&P+ passing attack. The difference could be on the other side of the ball as Virginia's run offense has a clear advantage between the trenches. UVA is 15th and 14th nationally in rushing opportunity rate and stuff rate, they'll be facing a Gamecocks defense that is 118th and 98th in the same categories. If the Cavaliers can control the clock with its strong secondary backing it up, they should stay within the number, which is up to 5.5 at the Westgate as of Thursday's writing. __MORE:__ ['Public all over Notre Dame' vs. Clemson, oddsmaker says](https://www.betchicago.com/college-football-playoff-odds-betting-lines-notre-dame-clemson) | [Wednesday betting recap](https://www.betchicago.com/first-responder-bowl-bc-boise-state-betting-refunds-weather) # 2018 college football bowl game odds for Saturday, Dec. 29 ## Peach Bowl betting lines, odds and prediction 11 a.m. CT on ESPN from Atlanta ### Florida vs. Michigan __Point spread:__ Michigan -5.5 __Total:__ 50.5 __Betting line movement and games notes:__ Michigan opened as a 7.5-point favorite at the Westgate earlier this month but movement on Florida has picked up steam the past week. The Gators can still be bought at +6.5 at MGM properties in Nevada. __S&P+ prediction:__ Michigan 30, Florida 24 __Note:__ S&P+ rankings are an advanced data set of tempo- and opponent-adjusted components of the five factors of college football: Efficiency, explosiveness, field position and finishing drives. Per creator Bill Connelly, a fifth factor, turnovers, is informed marginally by sack rates. __Play and win:__ [Join our free contests](https://betchicago.chalkline.com/) ## Florida betting records, stats 2018 SU record: 9-3 2018 ATS record: 8-4 2018 O/U record: 7-4-1 S&P+ rank: 14 Off. S&P+ rank: 27 Def. S&P+ rank: 26 Special Teams S&P+ rank: 9 ## Michigan betting records, stats 2018 SU record: 10-2 2018 ATS record: 6-6 2018 O/U record: 7-5 S&P+ rank: 5 Off. S&P+ rank: 24 Def. S&P+ rank: 5 Special Teams S&P+ rank: 40 ## Florida vs. Michigan Peach Bowl betting trends OVER is 9-2 in Wolverines' last 11 bowl games. Wolverines are 4-9 ATS in their last 13 games after allowing more than 40 points in their previous game. Gators are 3-8 ATS in their last 11 games as an underdog. ## Belk Bowl betting lines, odds and prediction 11 a.m. CT on ABC from Charlotte ### South Carolina vs. Virginia __Point spread:__ South Carolina -5.5 __Total:__ 54 __Betting line movement and games notes:__ South Carolina opened as just a 3.5-point favorite at Treasure Island and that shop still sits at 4.5 as of Thursday while other sportsbooks got as high as 6 mid-week. The total has fluctuated between 53.5 and 54 since opening. __S&P+ prediction:__ South Carolina 30, Virginia 27 ## South Carolina betting records, stats 2018 SU record: 7-5 2018 ATS record: 7-5 2018 O/U record: 7-5 S&P+ rank: 33 Off. S&P+ rank: 29 Def. S&P+ rank: 61 Special Teams S&P+ rank: 3 ## Virginia betting records, stats 2018 SU record: 7-5 2018 ATS record: 8-4 2018 O/U record: 7-5 S&P+ rank: 42 Off. S&P+ rank: 65 Def. S&P+ rank: 29 Special Teams S&P+ rank: 70 ## South Carolina vs. Virginia Belk Bowl betting trends OVER is 6-1 in Cavaliers' last seven non-conference games. Cavaliers are 4-1 ATS in their last five games as an underdog of 3.5-10.0. UNDER is 13-6-1 in Gamecocks' last 20 games as a favorite. Gamecocks are 7-18-1 ATS in their last 26 games as a favorite of 3.5-10.0. ## Arizona Bowl betting lines, odds and prediction 12:15 p.m. CT on CBSSN from Tucson ### Arkansas State vs. Nevada __Point spread:__ Arkansas State -1.5 __Total:__ 56 __Betting line movement and games notes:__ Arkansas State opened as a pick 'em on Dec. 3 at the Westgate but quickly moved to -1.5, indicating sharp action. The line has stayed between 1 and 2 since with the total dropping from 60 to 56. __S&P+ prediction:__ Arkansas State 32, Nevada 27 ## Arkansas State betting records, stats 2018 SU record: 8-4 2018 ATS record: 6-6 2018 O/U record: 4-8 S&P+ rank: 50 Off. S&P+ rank: 35 Def. 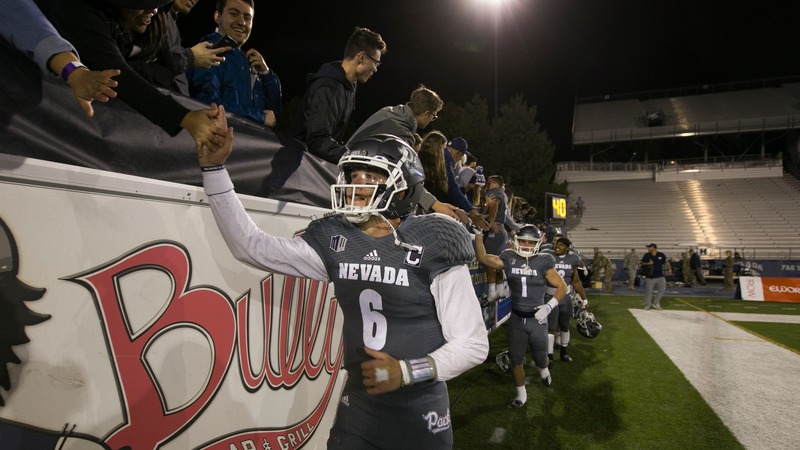 S&P+ rank: 65 Special Teams S&P+ rank: 92 ## Nevada betting records, stats 2018 SU record: 7-5 2018 ATS record: 6-6 2018 O/U record: 5-7 S&P+ rank: 79 Off. S&P+ rank: 72 Def. S&P+ rank: 68 Special Teams S&P+ rank: 71 ## Arkansas State vs. Nevada Arizona Bowl betting trends UNDER is 9-4 in Wolf Pack's last 13 non-conference games. UNDER is 13-2-1 in Arkansas State's last 16 games following a ATS win. Red Wolves are 4-0 ATS in their last four games as a favorite.